Trichothiodystrophy (TDD) is a member of a group of diseases called DNA repair disorders. These disorders cause problems with fixing damaged DNA. Damage to DNA happens constantly. It is caused by such things as ultraviolet light in sunlight and flourescent lights. Other things that can damage DNA include ionizing radiation from X-rays and other medical devices. Chemicals, normal processes in cells, and other substances or processes can also damage DNA. Because damage occurs all the time, living things have evolved many systems for fixing it. There are proteins that recognize that damage has occured, enzymes that remove the damaged DNA, and enzymes that insert new, undamaged DNA bases. This list is not exhaustive. When a person has a defect in one of these repair systems, disease results. If the problem is in a system that fixes damage from UV light, a person may be extremely photosensitive, with some people burning badly after only a brief exposure on a cloudy day. Overall, DNA most people with DNA repair disorders have a high risk of cancer. TTD is an exception to this rule --- people with this disease do not have an increased cancer risk. In most cases of TTD, patients cannot repair damaged done by UV light. Patients tend to be very prone to sunburn as a result, although not all patients have this problem. Some TTD patients do not sunburn easily, though most do. Easy sunburning actually tends to have a protective effect, because patients often naturally avoid UV light as a way of minimizing painful sunburns. In many patients, a sunburn following minimal sun exposure is the first sign of disease. Unfortunately, the sunburn may be mistaken for child abuse. In addition, many people with TTD are born with a collodion membrane. 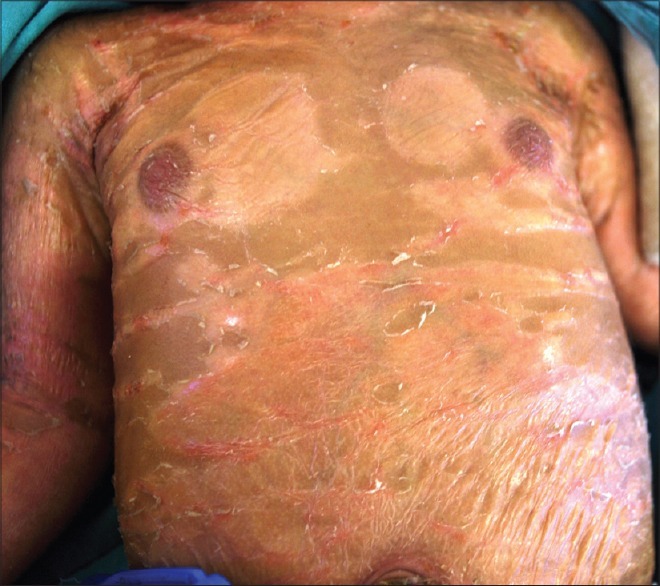 This abnormality causes a newborn to looks like the as though he was dipped in hot wax, or as though he was wrapped in plastic wrap (see photo at bottom of page). In addition, pregancy complications happen in a large majority of pregnancies. Specific hair abnormalities are best viewed under a microscope. However, they may not always be present, particularly in children under age 2. It is therefore important to recheck hair if nothing is found. TTD is also called PIBIDS, IBIDS, BIDS syndrome, and Amish brittle hair syndrome. TTD is more common among the Amish than other groups. 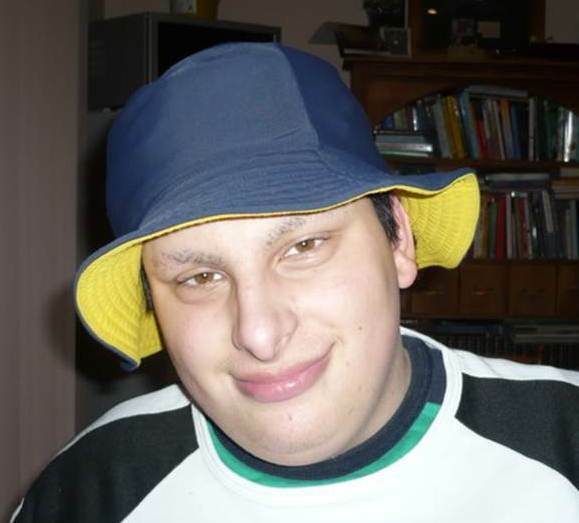 TTD is an autosomal recessive disorder. This term means that it is caused by a mutation in a gene not located on an X or Y chromosome, and that both parents must contribute a copy of a mutated gene. 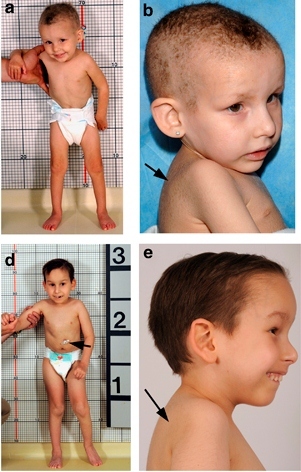 The diagnosis can be confirmed by testing for mutations in the genes TTDA, TTDN1, XPB, and XPD. The US National Institutes of Health maintains a list of testing centers (see link at right). If you are not a doctor and suspect that your child has TTD, check with your family physician, who will compare your child's signs and symptoms with those known to occur in this syndrome. If your child's doctor isn't familiar with TTD, the information in this large review of cases (1) may help. Your doctor can obtain a sample from your child and send it to a testing center. A number of other diseases resemble TTD. One is Netherton syndrome (NS). Like TTD patients, NS patients have brittle hair, red skin (but it is not due to photosensitivity), and ichthyosis. In addition, children with NS may be very short and intellectually disabled, although a majority of NS patients are not intellectually disabled. This fact can make it difficult to distinguish the two conditions. One abnormality that can help in that regard is that a majority of TTD patients are born with a collodion membrane, which is a shiny membrane covering the newborn. The membrane may resemble plastic wrap. NS patients do not appear to have this problem. Two other diseases that resembles TTD are Cockayne syndrome (CS) and xeroderma-pigmentosum-Cockayne syndrome (XP-CS). All of these conditions are DNA repair disorders, and although many genes are associated with them, they can all be caused by mutations in two of the same genes (XPB/ERCC3 and XPD/ERCC2). In general, the medical features of these conditions are very close to each other. TTD can be distinguished from the other two by characteristics of the hair and nails. CS patients do not have the hair or nail abnormalities seen in TTD patients. 1. Faghri S et al. (2008) Trichothiodystrophy: a systematic review of 112 published cases characterises a wide spectrum of clinical manifestations. J Med Genet 45(10):609-621. Full text on PubMed. 2. Zhou X et al. (2012) Abnormal XPD-induced nuclear receptor transactivation in DNA repair disorders: trichothiodystrophy and xeroderma pigmentosum. Eur J Hum Genet 21(8):831-837. Full text on PubMed. 3. 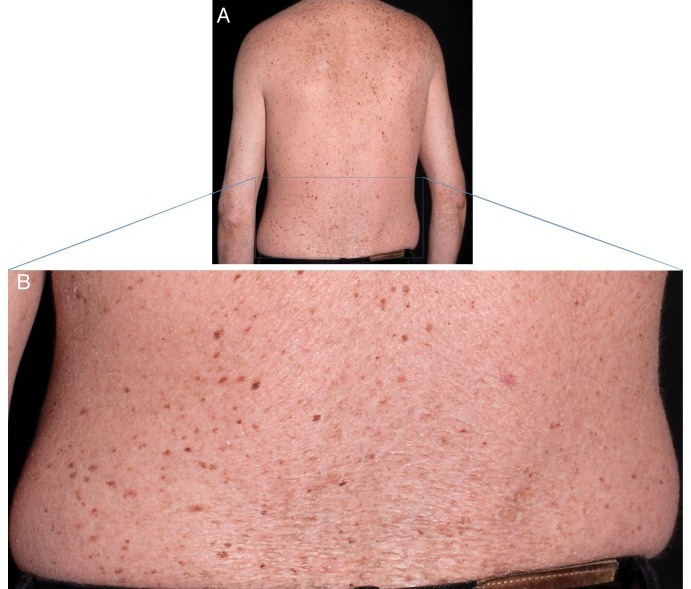 Kralund H et al (2013) Xeroderma Pigmentosum-Trichothiodystrophy overlap patient with novel XPD/ERCC2mutation Rare Diseases. Ann Dermatol Venereol 134(3 Pt 1):245-248. Full text on PubMed. 4. Sadana DJ et al. (2014) A clinical and statistical survey of cutaneous changes in the first 120 hours of life. Indian J Dermatol 59(6):552-557. Full text on PubMed. 5. Goulet O et al. (2008) Syndromic (phenotypic) diarrhea in early infancy. Orphanet J Rare Dis 3:6. doi: 10.1186/1750-1172-3-6. Full text on PubMed. Above: Paintbrush hair in TTD. Abnormalities in the hair shaft lead some hairs to shred when they break. Photograph from reference 5. 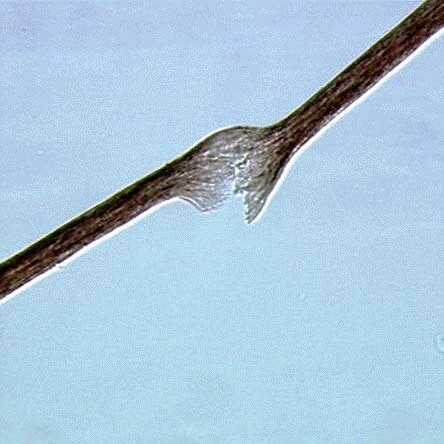 Below: Tiger tail banding in a hair sample taken from a patient with TTD. 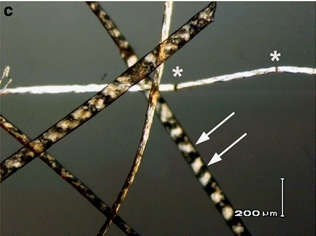 This phenomenon is visible under polarizing microscopy. Photograph from reference 2.
has koilonychia, or spoon nails. See reference 3 for details. visible scaling. See reference 3 for details. unable to stand without assistance. Note relative size of her parent's hand. (b) TTD patient TTD354BE at age 7 years. Her hair is extremely brittle and breaks easily. is present on her back (arrow) and chest. mild ichthyosis (arrow) with cheerful affect. See reference 2 for details. Foundation. Photo source: reference 4.